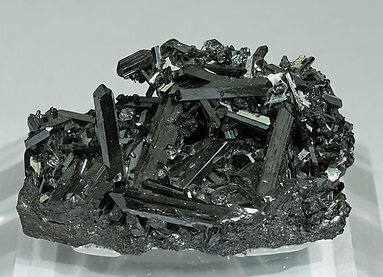 Group of doubly terminated crystals, perfectly defined. They are formed by the prism and the dipyramid, with an excellent luster. Crystal size is notable for the species. 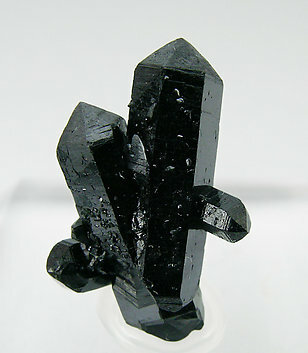 Black bright thin prismatic crystals of Gaudefroyite with very well defined faces and edges and excellent terminations. They are with a sharp white Baryte crystal and are on a matrix coated by small crystals of deep colored Andradite. 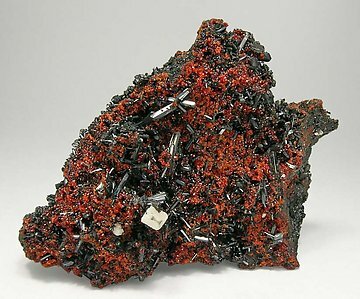 Irregular aggregate of very sharp Gaudefroyite crystals that are very aerial, bright and are with small white Baryte crystals.